The Comforter Super 33 from Golden Technologies Comforter Wide Series is made to fit those 6'3" to 6'8" in height. Featuring a plush, seamed backrest with lumbar support, a soft, comfortable seat and "grip rite" arm design. 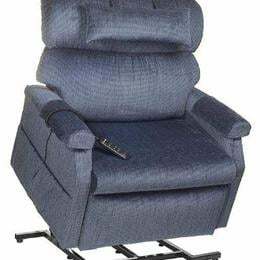 The Comforter Wide Series offers wider seats to accommodate people who need more space between the armrests and has a 700LBS weight Capacity.